You’ve done your DNA and you do not understand what the results mean. You want help. Family Ancestrees will take a look at your results and create a review for you, helping you to better understand your matches. The review includes helpful links to the Shared cM project, DNA Painter and a Leeds Method cluster chart of your matches. Did you know that your “raw DNA” can be uploaded to other sites for more matches and medical information? Links to where to find this are all included in the price. Note: This will require sharing your AncestryDNA results and Ancestry Tree with Family Ancestrees. We will contact you with a private email to share to. The client completes the kit, Family Ancestrees Rep meets with client for 30 minutes to discuss, take notes and start a Family Pedigree for the client. 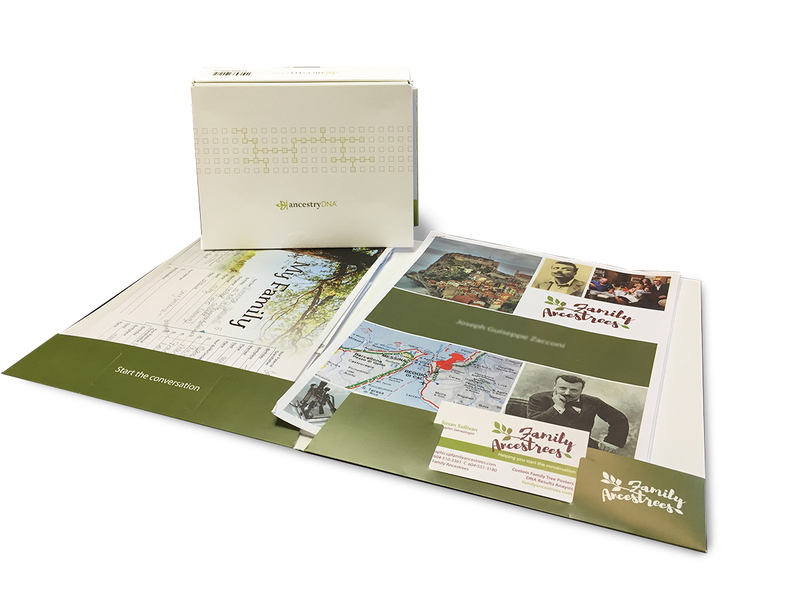 Family Ancestrees activates the kit online, mails it in and manages the Ancestry profile. A Family Pedigree is started online with the target of 4-6 generations within 5 hours of records hunting. Tree is attached to the DNA Profile. Customer retains full access to account. Family Ancestrees will report back when results come in on the ethnicity and top cousin matches. If you have more questions or ideas about posters, talk to us! We would love to hear your ideas and answer your questions. #203 – 20189 56th Ave.